four stone quarries, operating illegally in Thane, were closed by the district administration in August following orders of the Bombay High Court. The court has also sought details on all mines operating in the district and on the outskirts of Mumbai. The orders were passed on a petition that said contractors were flattening the hills by quarrying stones. The activities are being carried out in an unsafe and unscientific manner, said the petition by Thane resident and activist, Pradip Chandrakant Indulkar. 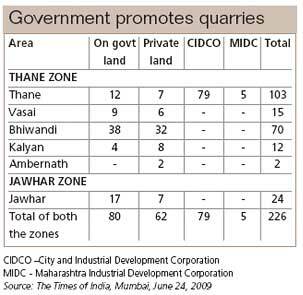 There are over 200 quarries in Thane and Jawhar Zone on Mumbai's periphery (see box). Quarrying is on in three forest sites near Ovale village in Thane. In Bhayandar Pada village, quarrying has been extended beyond the permissible area, said Indulkar.The mining has reduced the 400-year-old Nagla Fort, off Ghodbunder Road in Thane, into a heap of stones, Indulkar said. He said the government agencies failed to act despite repeated complaints. A 2005 report of director of mines safety, Goa region, pointed out that explosives used in the stone quarries were unsafe for the workers and people living in Thane. The report indicted six quarry owners; no action was taken. Local media reports said these quarries belong to politicians. The same miners were quarrying stone in Bhayandar Pada village from land reserved for a picnic spot by Maharashtra Tourism Development Corporation. The Thane municipality approved mining on the land in 2007. Though the permission for quarrying expired in 2008, the miners did not stop work till the court intervened. "There was a tacit understanding that miners could continue their work till the picnic spot is developed," Indulkar said. The district administration is not too keen to close the quarries as it fetches Rs 68 crore annual revenue. Deputy collector Anmol Yadav said quarrying could not be banned completely because it provides work to many people. He said all the quarries are not illegal as flying squads carry out routine inspections and fine violators.